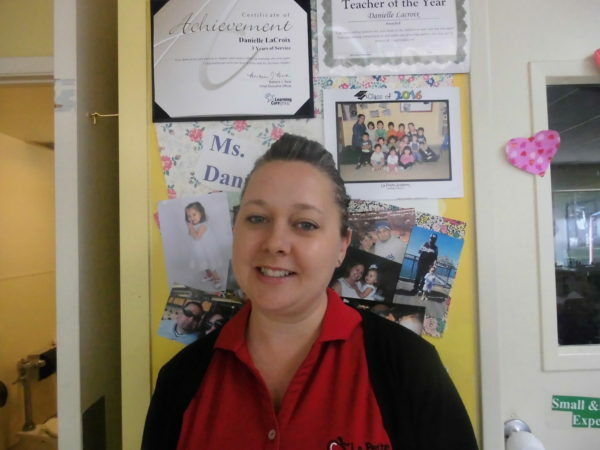 Meet Ms. Danielle, team lead and lead twos teacher who has been working with little ones at our Diamond Bar, CA location for more than three years! Read our Q&A with Danielle to learn more about this valuable member of our La Petite Academy staff! Tell us a little bit about your background and experience in early childhood education! I have my associates’ degree in child development and a few child development certificates. I do have office experience, as well. I’ve always only worked with children since I started working at age 18. What is it that you love about teaching? I grew up taking care of my siblings through middle school and high school. I’ve always known that I wanted to work with children. I just love seeing how they grow. I’m very nurturing to the children, so seeing them progress and grow and hearing parents’ feedback about what they’re doing at home based on what I do here is the best thing. What I teach their child is going to stay with them for the rest of their lives. How do you ensure strong communication between yourself and the parents? We have the PreciouStatus app, so I send parents updates throughout the whole day. I’m able to answer any questions that they have based on that. At morning time drop off and in the evening, I know which parents want to know certain details of the children’s day, so I express that to them at that time. They can also call here throughout the day if they want to speak to me personally. We do have our conferences throughout the year, as well. I’m very open to whatever I can do to help the parents just as much as the children. What are some of the funny moments you experience each day? One incident happened the other day. We were having our Valentine’s Day party and one of the girls in the class is very demanding, because at this age, they all are. I was passing out the fruit and it happened to be mango, and she kept asking, “Ms. Danielle, I want mango! Ms. Danielle, I want mango!” and I said “I’m getting it, be patient!” And she was getting kind of angry with me because I hadn’t given it to her yet. As soon as I gave it to her I said, “here’s your mango,” and before I could say anything else, she gave me this huge, cheesy smile and said “Thank you, Ms. Danielle!” And it was just so funny because her mood changed within that second. Little things like that make me laugh. It’s wonderful. Well, the parents always complement me on being very loving to their children, very nurturing. I guess that’s be it. All the teachers are very caring and very loving. We don’t have a high turnaround in teachers at this school, so everyone’s like a little family. The reward is just seeing how the children are growing. I’ve had children who have been in the infant classroom and now they’re in the pre-k classroom, so seeing how much they’ve progressed and how much they’ve grown, their vocabulary, their behavior, everything. I think that’s the biggest part.